All about the hammies! Are stretching and foam rolling leaving you with temporary improvement but no sustainable change? By now people are starting to understand that foam rolling and lacrosse ball work is not going to be the miracle fix for your tight tissues, but if thats not going to do it, what is the solution? There are many researched methods to improve range motion and keep those gains, our solution is just one way that we have found to be effective. The simple premise to our system is: Decompress the joints first to optimize their mobility, next focus on lengthening the tissue around those joints. Once you have created long and strong tissues, you need to provide them with effective proprioceptive feedback and teach them to control movement. Once the movement patterns are controlled, your can start to load the movement. Movement is the answer. 9 times out of 10 people cant attribute their tightness/pain to a specific event like an accident, a fall or impact. Or sometimes they try to attribute it to something: “I slept funny”, “I ran when it was raining”(I’ve heard this), “I got new shoes”. If this is the case for you, it is more than likely that your pain or tightness is because of a less than optimal movement pattern. Here is our sample routine to help you get rid of your “tight hamstring” issue for good. Decompress – Quadruped position, find pelvic neutral by placing a foam roller or bottle on the small of your back & fill those lungs 360 degrees. Lengthen – Single leg quadruped rock back with PIR stretch on the adductors. Rock back the weight into your heels without breaking the neutral position of your low back. Lightly press your leg into the ground, activating the adductor muscle group. Hold this contraction for 10 seconds & rock back further. Repeat. Control – Hip hinge with lateral glide. Focus most of the movement of the hip of the outside leg. Hinge backwards and begin to slide the other leg laterally away from your base of support. Keep about 80% of your weight in your planted leg. Slowly hinge your standing leg hip back up to upright position as your drag the leg back underneath you. Load – modified RDL. Keep a nice neutral spine. Work on loading your posterior chain, to do this make sure your standing leg is hinging backwards from the hip joint. 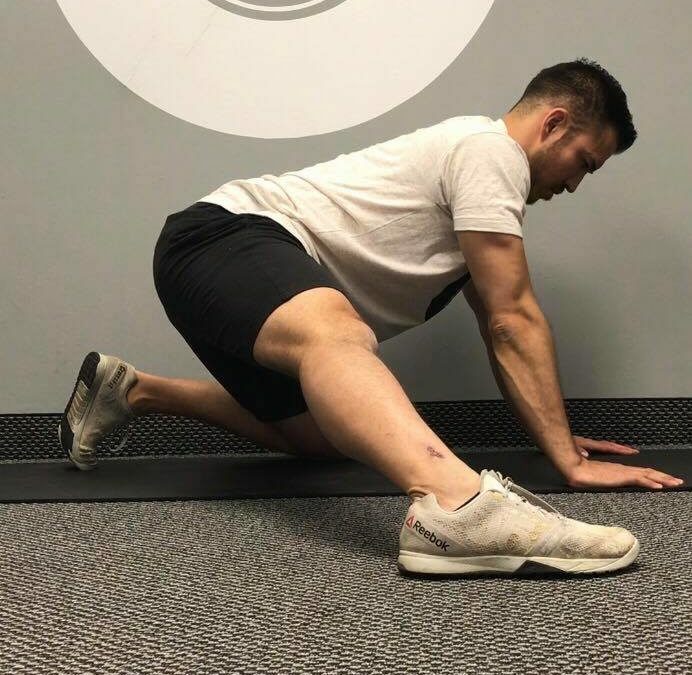 Try your best to keep your hip behind your knee and your knee behind your ankle throughout the movement. Start with a light load and work your way up to a working weight.